Cookie Crumbles	Fun for everyone! How Do You Drive This Thing? Jack and Paddy were on a mission. 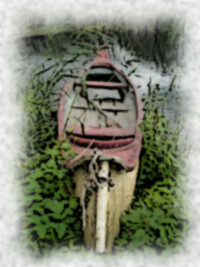 “It’s time we learned how to use the canoe,” Jack said. So, the grabbed the paddles, life jackets and the canoe. The marched it all down to the town dock and set everything up. Paddy climbed in, then Jack. They began to paddle. “I don’t think this is working,” said Paddy. So, after rearranging themselves in the canoe the started to paddle again. Once again, there was no movement of the canoe. “This is weird,” said Paddy. So Paddy turned around to face the same direction as Jack. More paddling. Still no movement. As they were wondering what to do next, Farmer Bill wandered by. If you enjoy my stories, you'll love my tee shirt designs too!